Alone with my tea: The Art of Conducting - Part 1: What does a conductor really do? 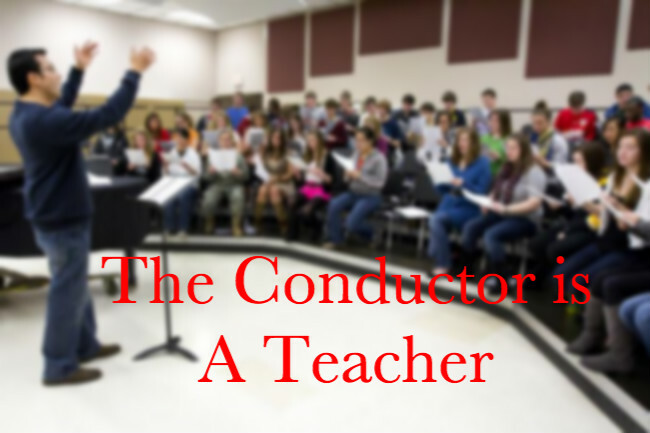 The Art of Conducting - Part 1: What does a conductor really do? I am often asked this question. Many people have not had the wonderful experience of being in an ensemble (the best part of being a musician, in my opinion), therefore they only see conductors from behind. 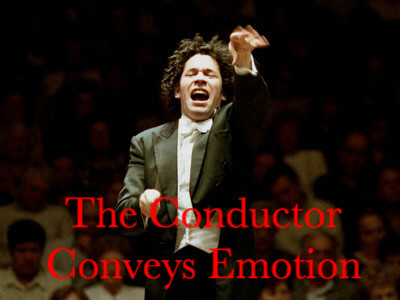 It might be difficult to discern what a conductor is really doing other than waving his arms around. In fact, conducting is one of the most challenging professions. Conductors spend hours and hours studying the music before they are even in front of the ensemble! The conductor has to make every musical decision before the first rehearsal. 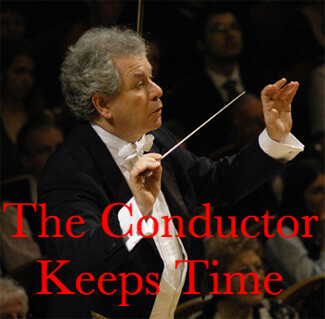 What many people think a conductor does. Picture from "Have you heard it"
To make this easier, I came up with 3 main points and gathered some quotes from various articles and interviews with famous conductors to further illustrate the points. Click on the quotes to read the full articles. 1. The conductor is a teacher. The conductor spends many hours rehearsing the ensemble. He/She teaches many things, ranging from style and performance practice, to language and pronunciation, to tempi and expression. For example, in Renaissance choral music, should there be a retardando at each cadence? In Baroque chamber ensembles, does everyone have free reign to ornament as they please? ...one of the main things an orchestra conductor does is to prepare the orchestra in rehearsal for the way he/she wants the piece to sound in performance. A lot of stuff is conveyed in that way that the conductor then won't need to attempt to convey in real time during the performance. In Italian, the word maestro also means teacher. As we power toward the final cadence and I exchange glance after glance with the young musicians, it occurs to me that they are bombarding me with unspoken questions and it’s my job to convey answers. That’s what a conductor does: mold an interpretation by filtering the thousands of decisions packed into every minute of symphonic music. 2. The conductor keeps time. The goal is for every musician to be in the exact place at the exact time. The right note played at the wrong time is the wrong note. Basic conducting is done via the use of "patterns" that correspond to certain time signatures. When a conductor conducts music in 3/4 (3 beats per measure), there will be 3 precise places that the baton is expected to be during the measure, and the musicians can always look up and follow that pattern. Some pieces...have a lot of changes of tempo, or a lot of starting and stopping. In cases like that, a conductor is really an indispensable part of having a performance come off non-disastrously! Furthermore, a lot of pieces are written in a complicated enough texture or rhythm that the musicians cannot necessarily hear what the beat is all the time, and need some visual help to stay together (this is especially true of very slow music, and of a lot of twentieth-century music). Aside from this, when ensembles don't need help staying together, the conductor will do a lot of gesturing to elicit slight changes in dynamic level, expressive character, and so on, from the musicians. Very good ensembles, when working with a conductor they respect, will absolutely respond in real time to these gestures. Less good ensembles will often not be able to do so and will mostly watch the conductor for cues. 3. The conductor is responsible for musical expression. Every single musical decision is prepared ahead of time and rehearsed with the ensemble before the performance. Where will the choir put the final "t?" How quickly will the brass diminuendo? These are decisions the conductor makes and conveys to the ensemble. A disjunct final consonant can disrupt a beautifully sustained melody. The conductor has to show the phrases and musical ideas with precision and expression. The conductor "becomes" the music by showing it on their face and deciding which hand movements to use. A good ensemble is essentially a mirror of the conductor. A conductor has to be simultaneously ahead of the music and with it, experiencing and expecting at the same time—manufacturing an extended déjà vu. ‘Your whole personality (especially your face and eyes) has to give the sense of assurance and expectancy that inspires an orchestra to play.’ Controlling tempo and dynamics is another answer. Baroque ensembles can get away with having no conductor, Seaman argues, but the 80-odd musicians of a modern orchestra could never agree on the shape of a Romantic rubato (‘robbed time’, a kind of lingering that’s paid for later) without a conductor to describe it in the air for them. Ok, so that's just a little bit of what a conductor does. I hope you enjoyed this little music lesson. Let me know if you have any questions. Next time, in "The Art of Conducting," we will discuss how a conductor studies a musical score!